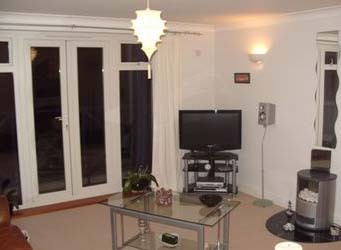 Eastbourne flat, 2 bedroom flat offered for rent by the owner in Eastbourne, Sussex. New and part furnished luxury 2 bedroom apartment with ensuite shower and second bathroom, situated in the most interesting harbour approaches location with fabulous views from windows of sea, beach and yachts. Modern kitchen with all appliances washing machine, fridge freezer, dishwasher. Dining area adjoins comfortable lounge with signal for sky TV, broadband etc. Drive into your allocated car space, take the lift to the third floor and sit in the sun on your balcony sipping your martini and watching the boats glide by! Ideal for creative professionals who want to live and relax in style. £169 per week.